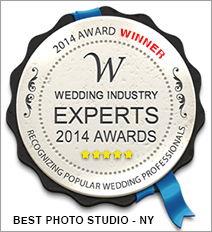 Artvesta Studio Won “The Most Popular Photo Studio in New York” Award – 2014! Hello everyone! I’m incredibly excited to announce that we have won “The Most Popular Photography Studio in New York” award by the Wedding Industry Experts. The Wedding Industry Board announced the winners on June 15th, 2014. I am so proud and thankful to everyone who nominated me to this award, supported and voted for me in this competitive endeavor. We are also among Top 5 Most Popular Photography Studio in the United States and Top 10 Most Popular Photography Studio – Worldwide. It has been a great privilege to serve you, our dear clients. Thank you for your loyalty and your appreciation. We love you! Tatiana Valerie and the entire Artvesta Studio team.